Can wearables make fasting more efficient? For one month every year, millions of Muslims around the world celebrate Ramadan. That means no eating or drinking from sunrise to sunset every single day. And yes, no drinking means absolutely no water. I've been taking part every year since I was five-years-old, but lately I've been wondering. Wearables are in a good place right now. They contain software that can allow you to track your fitness goals, they integrate with calorie counting services and they can even track your sleep. It just so happens that three of the big physical hurdles of Ramadan are properly managing your exercise time, watching what you eat and trying to get a normal night of sleep. Eating bad and not often enough, overdoing your exercise and not sleeping is a terrible combination, after all, so why not see whether wearables can help me get a better handle on all of it? 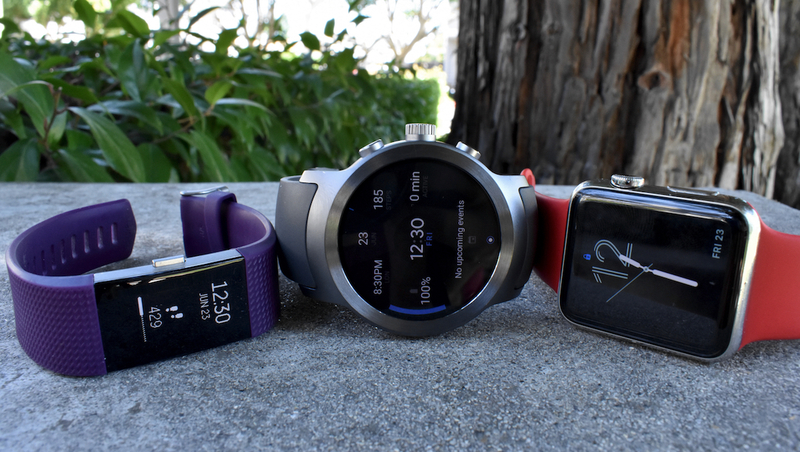 I decided to take three wearables and pit their health services against each other for a week: Apple Watch and Apple Health, the LG Watch Sport and Google Fit, and Fitbit Charge 2 and its platform. Fitbit's setup is pretty robust, tracking sleep and allowing you to log food right within the app, but Apple and Google's solutions need some help. That's why I paired MyFitnessPal with both Google Fit and Apple Health, and turned to Sleep by Android and AutoSleep to track my zzz's. And yes, I wore all three wearables at all times during this adventure. For science. It was not a good look. The toughest part of Ramadan isn't the food or water, it's the sleep. I usually go to bed at about midnight, and wake up at about 6:45am. In Ramadan, however, I go to bed at midnight and wake up at 3:30am to eat breakfast, then go back to bed at about 4:30am and wake up at 6:45am. That's a recipe for disaster. Could I use my sleep data to actually help me improve my sleep? When it came to Google Fit and Apple Health, that was a huge no. While AutoSleep provides a good set of data that allows me to see when I was in deep sleep, when I was restless and when I was awake, Apple Health didn't pull all of that in. Instead, it puts it in a small purple rectangle that's impossible to read. All it really does is show me when I was sleeping, and then it has the nerve to call it "sleep analysis." Hah! Right, "analysis." Google Fit is not much better, only pulling in the amount of hours I was asleep from Sleep by Android, which was at a disadvantage when matched up against Fitbit and AutoSleep. Sleep by Android doesn't do automatic sleep tracking, you have to remember to turn it on and off when you go to sleep and wake up. How can I expect to remember to turn it off when I'm waking up like an extra from The Walking Dead? I would, naturally, forget to turn it off at 3:30 in the morning, throwing off my entire data set. Sad. It's not missing it by small numbers either. Sleep by Android regularly recorded that I got about 9 to 10 hours of sleep a night. Apple Health and AutoSleep logged just over 6 hours, while Fitbit logged about 5 hours and 45 minutes. That's the difference between a great night of sleep and a mediocre night of sleep! Fitbit's sleep tracking proved the best. While it was the most accurate, it did mistake me relaxing on the couch after work as sleeping. I wasn't really sleeping, I promise, but Fitbit insists that I was. He said, it said, I suppose. Regardless, it had the best interface of the lot. I was easily able to see when I was in light, deep and REM sleep. And I was able to see that when I went to sleep at midnight, I was a little too close to REM sleep when I woke up at 3:30am, making myself even more groggy. I adjusted by sleeping an hour later and waking up an hour (sometimes two, if my schedule allowed) later, which hurt my morning person sensibilities but ended up making me feel a whole lot more refreshed. Fasting from sunrise to sunset in California means not eating from 4:30am to 8:30pm. That's a long, long 16 hours of no food and water. The natural tendency is to either stuff yourself in the morning or gorge in the evening, but neither is very good for you, although it is certainly tempting with the parade of traditional foods like samosa and dessert like ice cream to stave off those 90-degree California nights. MyFitnessPal proved to be a useful tool, despite it being nearly impossible to log homemade Indian food. Seriously, unless I construct the food from scratch by inputting a thousand ingredients, I just have to kind of guess what chain Indian food is the closest. Same goes for Fitbit. Anyway, its integration with both Apple Health and Google Fit bore completely different experiences. Google Fit is supposed to integrate MyFitnessPal via a card within its app, creating it at the end of every day. Despite hours of trouble shooting, I was not able to get it to show up despite both services being clearly linked. Even if it did show up, it probably wouldn't outdo Apple Health's implementation of MyFitnessPal, which breaks down all your foods into various categories. All of a sudden, I could see how my protein varied by day, how my dietary cholesterol varied by day, how my carbs varied by day, how my saturated fat and total fat and sodium and potassium and vitamin c all varied my day. It was a treasure trove of information, but I didn't know what to make of it. So I turned to nutrition coach Brien Shamp. Despite eating Cheerios, a slice of toast, and a wheat pancake I was still getting pretty hungry at about noon. Shamp told me that my breakfast was way too high in carbs and sugar, which are terrible for keeping you energized throughout the day despite being absolutely delicious. Instead, I should add in some protein to keep me going. I swapped in some peanut butter instead of Cheerios and added an egg and, voila, my hunger pangs were fewer than before. Armed with actual information about what to do with my data and some more dietary advice from Shamp, I was able to keep adjusting my diet as the days went on. Fitbit's solution came in a close second for usefulness. While it didn't provide me the amount of data, it does pair the calories I ate with the calories I burned, which helped in self-policing not going overboard in a month where it's way too easy to go overboard. Water, by the way, turned out to be absurdly easy to track and maintain. A liter in the morning, a liter in the evening. Boom. The only trick with water was not overdoing the exercise and dehydrating yourself in the summer. I did not have the time nor the energy to head to the gym in the middle of the night. The last thing you want to do with an hour of free time is to waste it at a sweaty, stinky gym, so I figured the next best thing would be to figure out how far I could push myself during the day and make that my redline. Go hard early, find the barrier, and then keep from repeating it. I tend to walk a lot, so I figured using miles as the metric would be pretty good. After some trial and error in 90 plus degree Californian heat, I found myself way too thirsty after walking about 2.5 miles in a day. That was the redline, and I best not tempt its wrath. Strangely, Google Fit and the LG Watch Sport seemed to massively underreport distance traveled. For instance, the Fitbit and Apple Watch were both reporting that I walked about .8 miles on Saturday, June 17 (.81 for Apple Watch and .84 for Fitbit). Google Fit and LG Watch Sport reported .18 miles. How this happened, I have no clue. I wasn't using any fitness modes for any of the devices. They were all on my wrist at the same time throughout the day. I had both an iPhone and LG G6 in my pocket. Yet, somehow, it still happened. With Google Fit in the rear, again, it was left to Apple Health and Fitbit to fight for the exercise crown. And, well, Fitbit won. Fitbit's app just displays its information much simpler. It's all much less chaotic, and you won't be frantically tapping around trying to figure out how many miles you walked last Sunday, like you tend to do in Apple Health. Google Fit just isn't built to be a multipurpose tool like Apple Health and Fitbit are. It's pretty good at helping you record your exercises and keeping track of them, but showing you health related data is where it stumbles and falls, repeatedly. Fitbit and Apple Health are a lot closer in that regard, but it's also clear Apple Health is built for people who want a ton of data segmented away in a fairly convoluted setup. Apple has done good work simplifying some things, but it's clear stuff like activity data is still logged away in an absurd, frantic fashion. Fitbit had the best balance of everything. It's got good, genuinely useful sleep tracking capabilities. Its food tracking capabilities aren't going to give you the most detail, but it gives you what you need to know: your macros and how your intake-outtake situation is evolving. Plus, it's Fitbit, they know how to display your activity information by now. Still, these fitness trackers alone weren't enough. I had to turn to a nutrition coach to help me figure out what to do with my nutrition data. Despite having sleep insights, I received no insights from Fitbit on how to improve my sleep in a month where I was hurting from not having enough sleep. While wearables can help make Ramadan a more efficient affair, they're not going to do it by themselves.